A small town in summer packed with fun! That was this Saturday in Jordan, Minnesota. 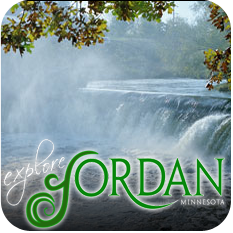 The summer celebration featured not one, not two, but four great events – the Jordan Art Festival, the Jordan Valley Bike Tour, Minnesota Kite Society Fly, and Jaycee’s Pork in the Park. Plus Sunday after second day of the art festival winds to a close, the Jordan Brewers will be playing baseball in downtown’s Mini-Met Park. And downtown storekeepers brought some of their best wares outside to the sidewalks. (So technically there are even more than four events!) There were artists demonstrating, bikers biking, kites flying, and pork roasting. There were musicians playing, children playing and baseball players playing. And for the Nicolin Mansion, it meant adding two more garden art sculptures to the courtyard – a wrought iron frog prince from Garden Designs & Sculptures, and a stained glass garden stake by Glorious Glass. Fun times in Small Town USA! We’ve enjoyed the growing trend of an artist community in Jordan, and Primary Colors is a fantastic new addition. In June, our friend (and inn-sitter) Cindy Nevins, opened the new gallery with 16 (and growing) local and regional artists, next door in “The Hub,” home of Frank Nicolin’s historic opera house. The pieces range from fine art to whimsical crafts, in mediums that include painting, photography, weaving and jewelry. Cindy, herself an artist, was inspired to open the gallery to showcase her vintage linens repurposed as pillows, dresses, and handbags (to name a few). But that’s not all you’ll find created by her hand – she also repurposes vintage furniture such as the bench for sale in the gallery recycled from a vintage double bed headboard. Update 1/1/11: Primary Colors has closed. But, you can still get Cindy’s repurposed linens and home decor items at Geneva’s Daughter Occasional Sale. Check our Jordan Events Calendar for upcoming sale dates. 3rd Place in Recycled Art Contest! The summer has flown by – I’ve been remiss at keeping up with this blog, so I’ll be spending the next few days catching up on some of the summer’s highlights. During the Jordan Art Festival, the Recycled Art Contest III was sponsored by 225 Water Street and The Vinery Floral, and I submitted an entry, and won third place! Thursday night is craft night for me and our innsitter – we take turns working on each others project that we have been wanting to finish. One of our latest projects has been transforming old windows from the mansion’s third floor into pieces of art. I have collected Jordan postcards, mostly from eBay, and they were scanned and resized to fit into the various sized window panes. We’ve been working on three windows, and the one entered in the Recycled Art Contest featured Jordan’s mud baths – Mudbaden and Jordan Sulpher Springs. We printed the scanned postcards as reversed images onto clear label paper, and were mounted to the back of the window. The clear paper allows light to shine through from the back giving a great visual effect to the images. Stop by the inn – we have three of these windows hanging in the front entry: “The Panes of Mud” window, a window of Jordan’s historic structures, and a window of Jordan street scenes.